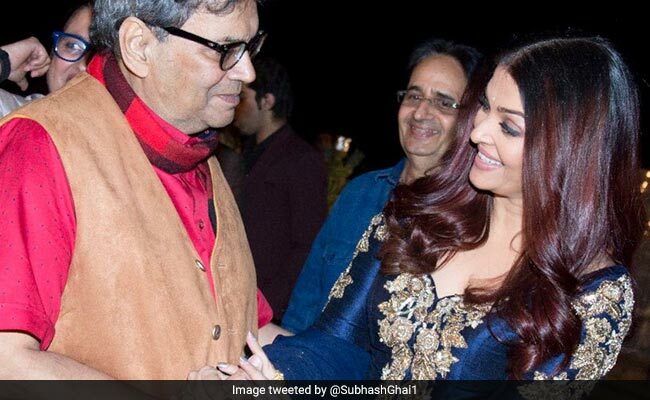 Aishwarya Rai Bachchan gave a lovely surprise to filmmaker Subhash Ghai on his 73rd birthday, which he celebrated on January 24. Subhash Ghai and Aishwarya have worked together in 1999's super hit film Taal and Aishwarya surprised the director by dropping by at his acting institute Whistling Woods to wish him on a his special day. Subhash Ghai shared the picture with Aishwarya on Twitter and wrote: "How real friends surprise you is always a treat. So did my favourite star Aishwarya Rai Bachchan by her surprise presence on eve of my birthday in a surprise party by my team @Whistling_Woods @MuktaArtsLtd @MuktaA2Cinemas on 24 January She is always gracious indeed." Indeed a special one, isn't it? Aishwarya Rai's Taal also starring Anil Kapoor and Akshay Khanna was an official selection for 2005's Ebertfest: Roger Ebert's Film Festival. Taal was also screened during the 2014 International Film Festival of India in the Celebrating Dance in Indian cinema section. Taal was a blockbuster at the box office and it became the first Indian film to reach the top 20 on Variety's box office list. Subhash Ghai has also directed several super hit films such as Karz, Hero, Meri Jung, Ram Lakhan, Saudagar, Pardes and Yaadein while Aishwarya Rai, who has starred in films such as Guru, Umrao Jaan, Devdas, Raavan and Jodhaa Akbar, was last seen in Karan Johar's Ae Dil Hai Mushkil, starring Ranbir Kapoor, Anushka Sharma and Fawad Khan. Aishwarya will soon star in Fanne Khan with her Taal co-star Anil Kapoor.